ISO 9000 series certification standards have been established by the International Standards Organization. ISO is comprised of representatives from standards organizations in 91 countries. ISO 9000 certification provides consumers of goods and services around the world with a single, recognized, comprehensive, and verifiable quality standard. It verifies the quality of a company's design, manufacturing, and service process. It also ensures that all products and services purchased from an ISO 9000 certified facility were produced with documented quality control procedures that meet worldwide standards. 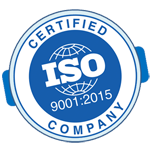 Since Pro-face/Xycom first received ISO 9001 certification in 1996, we have passed successive periodic inspections by independently ISO-certified auditors. In each of these audits, we have retained our ISO 9001 status - the most comprehensive certification of a company's quality process. It covers virtually every process or operation at Pro-face/Xycom that affects product quality, including: management, design, engineering, purchasing, manufacturing, and after-the-sale service functions. It also includes our personnel training and supplier evaluation procedures.